Joel Kachmarek hasn't pulled a core from the greens at Tacoma Country and Golf Club in five years. When Joel Kachmarek says he spends a lot of time venting on his greens, he's not talking about anger management issues associated with poor putting conditions. In fact, it's quite the opposite. After nearly two decades, Kachmarek couldn't be happier with the putting conditions at Tacoma Country and Golf Club. "No more hollow tine aeration," Kachmarek said. "I haven't done any of that since 2013. "Our greens are almost 120 years old, and they're the best they've ever been." There are differing schools of thought on aerifying greens - namely whether to pull a core, and what to do with them after extracting them. Kachmarek, a 19-year veteran of the club in Lakewood, Washington, wasn't always a devotee of solid tining. He tried it initially as a way to stretch the season for golfers. "That whole thing was facilitated by me wanting to get the greens leaner. I was just tired of watching the greens heal. When coring with hollow tines, it takes three to four weeks to heal. That's not cool for membership," Kachmarek said. "I wanted the greens to be good for them for more days out of the year. I didn't want to take away that perfect stretch of weather in the spring and that last stretch in the fall. I was always looking for a way to make this less painful for golfers." Through the years, he's gone from removing as much material as possible to aerating with solid tines at varying depths. "When I first started, I was on the other side of the spectrum where I was trying to figure out how to remove more material each time," Kachmarek said. "Now, I've really gone backwards the other way." It's a philosophy made popular by Roch Gaussoin, Ph.D., of the University of Nebraska, who for years has disputed the need to pull a core on greens. It also is one that works well for Kachmarek in the Pacific Northwest, but he admits might not be everyone. "Everybody should do it, but I don't think it would work everywhere," he said. "But I do think a lot of people would like to see if they could modify what they're doing." I've always said, 'you can aerify in March and you'll look good in May, or you can aerify in May and you'll look good in May.' You're going to look at holes for a long time if you aerify in March. Venting and aerifying with solid tines are important components of Fred Gehrisch's regime at Highlands Falls Country Club in western North Carolina, but they're just that - part of his program. So are core aerification and dry injection of sand topdressing. "I believe aerification is more than just a single type of aerification," Gehrisch said. "I'm a believer in core aerification and a believer in DryJect. I don't think one works that well without the other. "I think it takes a combination of all types to be successful." At Laurel Creek Country Club in Mount Laurel, New Jersey, John Slade runs DryJect over the greens usually in early May. With the end of the golf season in view, he core aerifies in mid-August. "In this area, people are all over the map, and it all has to do with the golf schedule," Slade said. "I've always said, 'you can aerify in March and you'll look good in May, or you can aerify in May and you'll look good in May.' You're going to look at holes for a long time if you aerify in March. "Because the greens are under stress in August, I don't want to put giant holes in the ground that are going to struggle to recover. Some guys wait until October because of golf. In that case, you're probably looking at holes all winter. Personally, I think what we are doing now is as good as we can do to help the greens make it through the summer." Aerification gets under way at Laurel Creek CC in New Jersey. 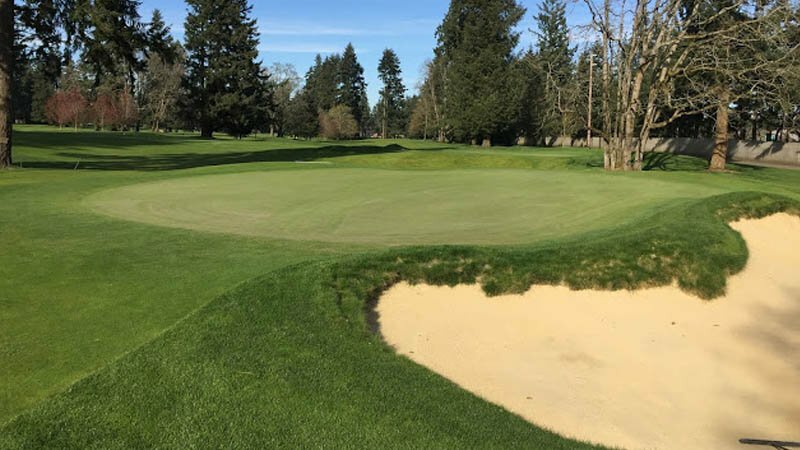 In Tacoma, Kachmarek does not see the dramatic weather swings that necessitate such cultural practices on golf courses on the country's east coast or, for that matter, the eastern edge of Washington. "Growing Poa in this climate in the Northwest, I know it works. You can't push nitrogen if you do this," Kachmarek said. "Hollow tines create vigor in the turf, and that is important. If your greens already are healthy and have adequate sunlight, then I should never feel the need to increase vigor." 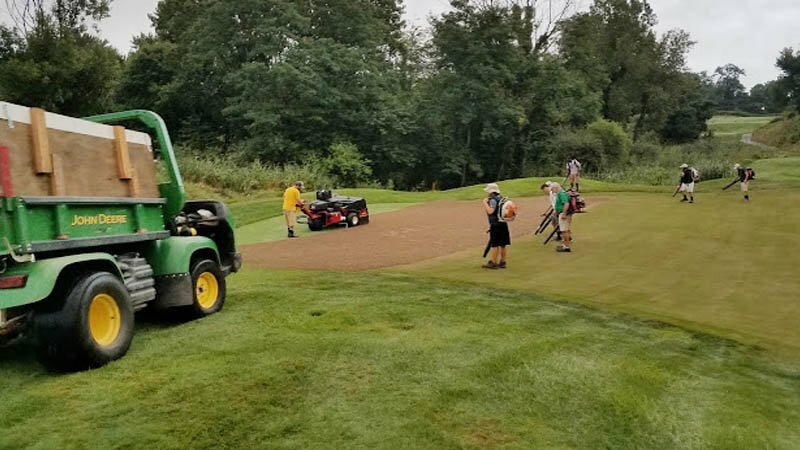 As much as core aerification helps Gehrisch provide optimal conditions at Highlands Falls, he's nearly as concerned about the effects of a program that wouldn't include it - namely all that sand going into the profile and nothing coming back out. What we do to golf courses and what Mother Nature does to golf courses is part of golf, and it's part of what is cool about it: It's forever changing. "You're putting all that material down and taking nothing out. At some point you are changing the shape of your green," he said. "That's a physical fact, and I don't see how you can maintain that. Eventually, it won't be the same green it was designed to be." That has occurred to Kachmarek, as well. "What will it take, 100 years of doing this to elevate a green 2 inches? It would be a soft build-up, not a ledge. And is that bad?" he said. "I don't know. I don't see it as a bad thing. "That's part of golf. Golf courses change. Weather, trees, architects all come in and change things. Golf courses are living things, they're not meant to be created and remain static forever. What we do to golf courses and what Mother Nature does to golf courses is part of golf, and it's part of what is cool about it: It's forever changing."